Passion fruit is a common fruit found in the tropical and sub tropical countries and is shaped like an egg with wrinkled skin. The flesh of the fruit is green in color with a unique aroma and is sweet to taste. So it is often used for making juice and is good to taste. It is great for keeping your body cool in the summer months and has lots of health benefits. Vitamin C present in this juice fights against the harmful actions caused by the free radicals in the body and prevents pre-mature ageing as well as keep the immune system strong. 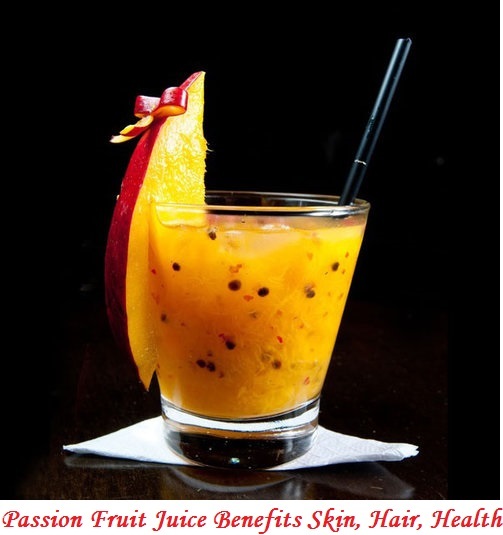 So, have passion fruit juice regularly and have a skin free from wrinkles and fine lines. Having passion fruit juice daily helps you in getting a healthy skin as it is rich in Vitamin A, which is essential for the skin. This vitamin is also good for proper cell growth and reproduction. You can maintain healthy hair only if nutrients and oxygen from the blood enters the hair follicles and nourish them. Most of the problems related with hair is due to improper food habits and deficiency in nutrients, as well as illness. Consuming passion fruit juice ensures that your hair gets nourished and it grows properly. Passion fruit is rich in Vitamin A, Vitamin B2, Vitamin C, Vitamin B6 and lots minerals like potassium, copper etc., which are essential for healthy of the hair. So, drinking passion fruit juice provides you thick and strong hair that is free of any problems. Passion fruit is highly nutritious and a excellent health drink that is good for getting relief from asthma and its symptoms. Vitamin C present in the juice helps in preventing histamines from attacking the body and causing symptoms of asthma. The alkaloids present in passion fruit juice are excellent for reducing blood pressure. It is also known for its antispasmodic action. They are also good sedatives and calm your mind and body. Beta carotene is good for the normal development of the bones and the teeth and for repairing the tissues of the body. It is also beneficial for having healthy eyes and has many other health benefits. The risk of Parkinson’s disease, arthritis, depression and infertility is greatly reduced by having passion fruit juice regularly. Beta carotene is non-toxic compared to Vitamin A, which toxic in excess. Passion fruit juice is very effective if you wish to lose weight because it is low in calorie. Only about 97 calories is produced by 100 gm of the juice. Sodium and fat are also found in small quantities in this juice. Being rich in natural sugars and carbohydrates, your body is able to recover fast after a workout, as the energy lost is recovered easily by having this juice. If you are suffering from insomnia, have a glass of passion fruit juice daily before you go to bed. This will ensure you a sound and peaceful sleep. This is because this fruit relaxes your nerves and calms you down. Passion fruit is a good source of Vitamin B2, Vitamin B6, choline and folate. All these vitamins are essential for the proper functioning of the mucous membranes in the digestive tract and also for normal functioning of the brain. They also ensure the mental health and improve blood circulation in the body. Lowering the levels of cholesterol in the body is another useful benefit of the fruit. So, have a glass of passion fruit daily and stay healthy both mentally and physically. Vitamin C in this juice is an excellent antioxidant that is very effective in increasing the immune power of the body and helps you to fight against various diseases and infections. It also helps to heal wounds fast because of its ability to repair damaged tissues. The yellow and purple color of the passion fruit is due to the presence of beta carotene in it in high amounts. Beta carotene is also called pro-vitamin A because it gets converted in to Vitamin A when it reaches the liver. It has anti-oxidative properties and is good for preventing heart diseases, cancer and for lowering blood pressure in people suffering from high blood pressure. Drinking a glass of passion fruit is very refreshing and keeps you cool. It is good for getting relief from the burning sensation in the stomach and keeps you relaxed and calm by relaxing your nerves. Consuming passion fruit juice is a good way to treat various digestive problems. It is good for preventing constipation also. It acts as a laxative and ensures proper bowel movements, preventing constipation. Having about 4 to 6 ounces of passion fruit juice at an interval of 2 hours is very effective in treating hyperacidity as well as duodenal and gastric ulcers. Passion fruit juice is a rich source of minerals, especially potassium. This is found in high quantities in the juice. It helps in the proper functioning of the kidneys and is also essential for the contraction of the muscles. Smokers, athletes and vegetarians benefit a lot by consuming passion fruit juice daily. It is very easy to make the juice. Take 5 or 6 passion fruits, wash well and then cut then lengthwise. Scoop the flesh from inside and blend in the blender with thrice the amount of water for just a minute. Now remove the black seeds from the juice with the help of a strainer and again add thrice the amount of water and sugar to taste. You can store it in the refrigerator and it will stay for about five days in this way. Have it chilled and you will see that it is very tasty. You can make two and a half liters of juice form 5 passion fruits.